GreenWall allows multiple guilds to share a common guild chat and officer chat. It also replicates achievement spam between guilds. It is designed to be a turn-key system that requires your guild members to do nothing more than install the add-on to participate. A quick-start guide that shows how to set up the guild-wide configuration for use with a minimum of reading and effort can be found at the following location. If your members are encountering duplicate messages or seeing '-' in place of the guild tag, please read the note about connected realms. The full documentation can be found on GitHub. 1.9.9 should fix guild chat. 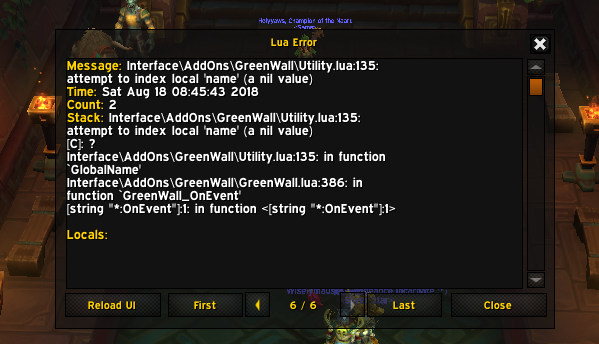 v1.9.6 lit up the lua error box for me. I keep errors on to catch small correctable problems or disable an offending addon but this was just uncharacteristically blasting me with new pop ups every few seconds. Reverting to previous version was safe bet for my situation. I run ElvUI + GW in case it helps anyone else for the time being. Thanks, here's the issue for tracking. Hey there, when our guild used GW before the patch we could right click on a name and invite to group, now it seems we can only do that if the member is in the same chapter of a guild. We have 3 Chapters of a guild on the same server. Is this something I am over looking? Opened a bug report for it. Question. I know that GreenWall only works in same realm or connected realm situations. Wouldn't it be possible to leverage Blizzard Group channels to accomplish similar functionality for connecting guild chats on non connected servers, though? It's worth having a look. I suspect the communities are implemented using the Battle.net infrastructure, which means it may not be feasible. In any case, I've opened a feature request for investigation of whether it's something that can be added. WE have four guilds linked on one server, the update just brought back wow communities, No one is able to speak to any other guild now. Is this fixable or are they trying to force us to use the communities now ? If it's the same issue as before, it is fixable. I suspect it is. Will be looking at it tonight. It was. It is fixed in 1.9.4. I know that the prepatch JUST hit today, but can we expect an update fairly soon? We have multiple Guilds, starting some anarchy :D haha.